This blog-post provides the reader with an overview of the Intel SGX technology. In this first part, we explore the additions made to Intel platforms to support SGX, focusing on the processor and memory. We then explain the management and life cycle of an enclave. Finally, we detail two features of enclaves: secret sealing and attestation. Intel SGX is a technology that was developed to meet the needs of the Trusted Computing industry, in a similar fashion to the ARM TrustZone, but this time for desktop and server platforms. It allows user-land code to create private memory regions, called enclaves, that are isolated from other processes running at the same or higher privilege levels. The code running inside an enclave is effectively isolated from other applications, the operating system, the hyper-visor, et cetera. It was introduced in 2015 with the sixth generation Intel Core processors, which are based on the Skylake micro-architecture. SGX support can be checked by executing the CPUID instruction with the Structured Extended Feature Leaf flag set, and checking if the second bit of the EBX register is set. To be able to use SGX, it must have been enabled by the BIOS, and only a few BIOSes actually support this technology. That is one of the reasons it is not widely used. when an enclave function is called, only the code within the enclave can see its data, external accesses are always denied; when it returns, enclave data stays in the protected memory. 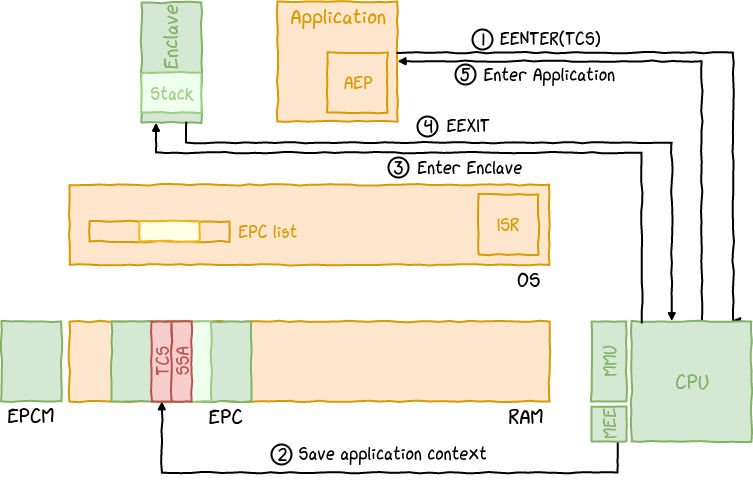 an enclave can access its application's memory, but not the other way around. Intel SGX defines 18 new instructions: 13 to be used by the supervisor and 5 by the user. All these instructions are implemented in micro-code (so that their behavior can be modified). See below for the complete instructions list. Intel SGX also defines 13 new data structures: 8 are used for enclave management, 3 for memory page management, and 2 for resources management. See below for the complete structures list. In the following sections, we detail the relevant instructions and structures, before giving a high-level explanation of how they are used to achieve some functionality. Enclave code and data are placed in a special memory area called the Enclave Page Cache (EPC). This memory area is encrypted using the Memory Encryption Engine (MEE), a new and dedicated chip. External reads on the memory bus can only observe encrypted data. Pages are only decrypted when inside the physical processor core. Keys are generated at boot-time and are stored within the CPU. The traditional page check is extended to prevent external accesses to EPC pages. 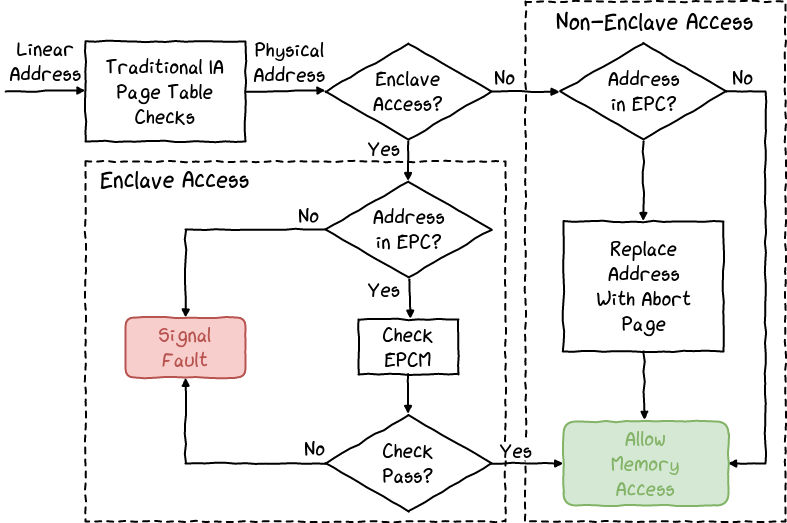 The Enclave Page Cache Map (EPCM) structure is used to store the pages state. It is located inside the protected memory and its size limits the size of the EPC (set by the BIOS, 128MB maximum). It contains the configuration, permissions and type of each page. The PAGEINFO structure is used as a parameter to EPC management instructions to reference a page. It contains its linear and virtual addresses, and pointers to SECINFO and SECS structures. The SECINFO structure is used to store page meta-data: access rights (read/write/execute) and type (SECS, TCS, REG, or VA). The PCMD structure is used to track the meta-data associated to an evicted page. It contains the identity of the enclave the page belongs to, a pointer to a SECINFO structure and a MAC. The VA structure is used to store the version numbers of pages evicted from the EPC. It is a special page type that contains 512 slots of 8 bytes to store the version numbers. EPA - This instruction allocates a 4KB memory page that will contain the pages version number array (VA) to protect against replay. Each element is 64 bits long. EBLOCK - This instruction blocks all accesses to the page being prepared for eviction. All future accesses to this page will result in a page fault ("page blocked"). ETRACK - This instruction evicts a page from the EPC. The page must have been prepared properly: it must be blocked and must not be referenced by the TLB. Before writing it into the external memory, the page is encrypted, and a version number and meta-data are generated, and a final MAC is performed. ELDB/ELDU - This instruction loads into memory a previously evicted page, in a blocked state or not. It checks the MAC of the meta-data, version number (from the corresponding VA entry), and the page encrypted content. If the verification succeeds, the page content is decrypted and placed inside the chosen EPC page, and the corresponding VA entry deleted. The EPC memory is defined by the BIOS and limited in size. 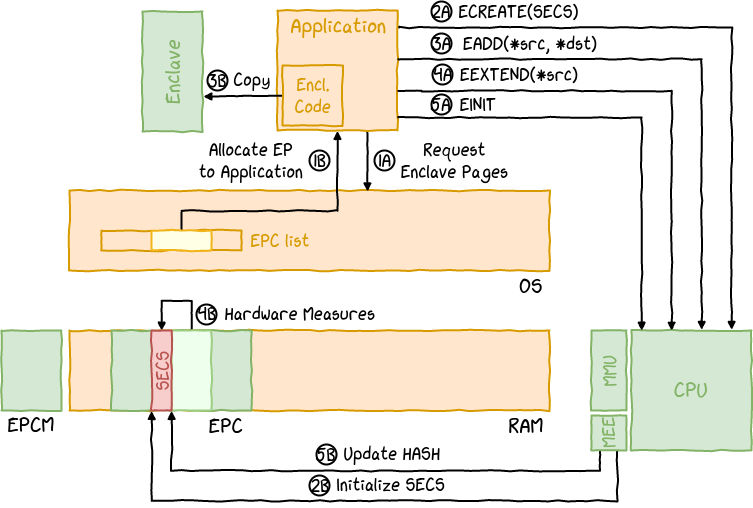 SGX has a way for removing a page from the EPC, placing it in unprotected memory, and restoring it later. Pages maintain the same security properties thanks to the EPC pages management instructions, that allow to encrypt an page and produce additional meta-data. A page cannot be removed until all cache entries referencing this page have removed from all processor logical cores. Content is exported or imported with a granularity of a page (which is 4KB). Each enclave is associated with a SECS structure, which will contain its meta-data (e.g. its hash and size). It is not accessible to any secure nor non-secure code, only by the processor itself. It is also immutable once instantiated. Each enclave is associated with at least a TCS structure, which indicates an execution point into the enclave. As SGX supports multi-threading, an enclave can as many active threads as it has TCS. Like the SECS structure, it is only accessible by the processor, and is also immutable. Each TCS is associated with at least a SSA structure, which is used to save the processor's state during the exceptions and interruptions handling. It is written when exiting, and read when resuming. Each enclave can use its stack and heap. The RBP and RSP registers are saved when entering and exiting, but their value is not changed. The heap is not handled internally, enclaves need their own allocator. Each enclave is represented by a hash of both its attributes and the position, content and protection of its pages. Two enclaves with the same hash are identical. This measure is called MRENCLAVE and is used to check the integrity of the enclave. Each enclave is also signed by its author. MRSIGNER contains the hash of the public key of the author. MRENCLAVE and MRSIGNER are produced using the SHA-256 hash function. The EINITTOKEN structure is used by the EINIT instruction to check if an enclave is allowed to execute. It contains the attributes, hash and signer identity of the enclave. It is authenticated using a HMAC performed with the Launch Key. Each enclave is associated with a SIGSTRUCT structure, which is signed by its author and contains the enclave measure, signer public key, version number (ISV, reflecting the security level) and product identifier (ISVPRODID, to distinguish between enclaves from the same author). It allows to ensure that the enclave hasn't been modified and then re-signed with a different key. ECREATE - This instruction instantiates a new enclave, defining its address space and root of trust. Those informations are stored in a newly allocated SECS. EADD - This instruction allows to add a new page to the enclave. The operating system is solely responsible for choosing the page and its content. The initial entry for the EPCM denotes the page type and its protection. EEXTEND - This instruction allows to add a page's content to the enclave measure, by block of 256 bytes. It must be called 16 times to add a complete page to the measure. EINIT - This instruction checks that enclave corresponds to its EINITTOKEN (same measure and attributes) before initializing it. It also checks that the token is signed with the Launch Key. EREMOVE - This instruction removes permanently a page from the enclave. The EINIT instruction finalizes the enclave creation. EENTER - This instruction transfers the control from the application to a pre-determined location within the enclave. It checks that the TCS is free and purges the TLB entries. It then puts the processor in enclave mode and saves the RSP/RBP and XCR0 registers. Finally, it disables the Precise Event Based Sampling (PEBS) to make the enclave execution appear as one giant instruction. EEXIT - This instruction puts the process back in its original mode and purges the TLB entries for addresses located within the enclave. Control is transferred to the address located within the application and specified in the RBX register, and the TCS structure is freed. The enclave needs to clear its registers before exiting to prevent data leaks. The processor is put in enclave mode. The processor is put in normal mode. ERESUME - This instruction restores the context from the current SSA and resume the execution. Interruptions and exception result in Asynchronous Enclave Exits (AEX). The Asynchronous Exit Pointer (AEP) points to a handler located inside the application that will resume the execution after the exception has been handled by the Interrupt Service Routine (ISR). The handler can decided to resume or not the execution of the enclave, by executing the ERESUME instruction. When an AEX happens, the context of the enclave is saved in the current SSA and the application context is restored. 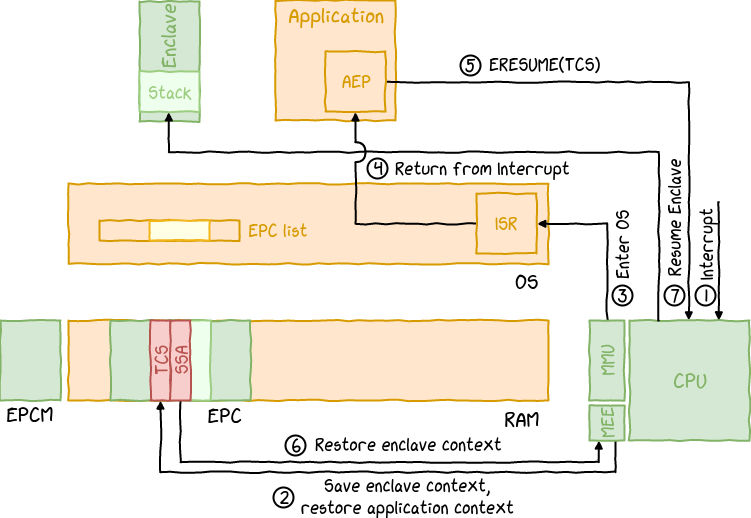 The enclave context is restored when the ERESUME instruction is executed. The TCS contains a counter denoting the current SSA, forming a stack of contexts. The execution resuming where it stopped within the enclave. EGETKEY - This instruction is used by an enclave to access the different keys provided by the platform. Each key enables a different operation (sealing, attesting). 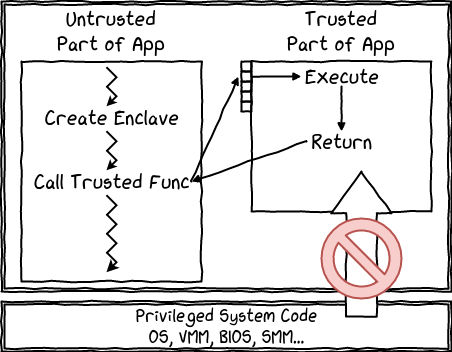 When an enclave is instantiated, its code and data are protected from external accesses. But when it stops, all of its data is lost. Sealing is a way of securely saving the data outside of an enclave, on a hard-drive for example. The enclave must retrieve its Seal Key using the EGETKEY instruction. It uses this key to encrypt and ensure its data integrity. The algorithm used is chosen by the enclave author. The sealing can be done using the enclave identity. The key derivation is then based on the value of MRENCLAVE. Two distinct enclaves have different keys, but also two versions of the same enclave, which prevent the local migration of data. The sealing can also be done using the signer identity. The key derivation is then based on the value of MRSIGNER. Two distinct enclaves still have different keys, but two versions of an enclave share the same key and can read the sealed data. If multiples enclaves are signed using the same keys, then they can all read each other's data. Older versions of an enclave should not be allowed to read data sealed by a newer version of an enclave. To prevent it, the Security Version Number (SVN) is used. It is a counter incremented after each update impacting the security of the enclave. Keys are derived using the SVN in a way that an enclave can retrieve the keys corresponding to current, or older, security level, but not newer. The KEYREQUEST structure is used as an input to the EGETKEY instruction. It allows to choose which key to get, and also additional parameters that might be needed for the derivation. The TARGETINFO structure is used as an input for the EREPORT instruction. It is used to identify which enclave (hash and attributes) will be able to verify the REPORT generated by the CPU. The REPORT structure is the output of the EREPORT instruction. It contains the enclave's attributes, measure, signer identity and some user data to share between the source and destination enclaves. The processor performs a MAC over this structure using the Report Key. EREPORT - This instruction is used by the enclave to generate a REPORT structure containing multiple informations about it and authenticated using the Report Key of the destination enclave. 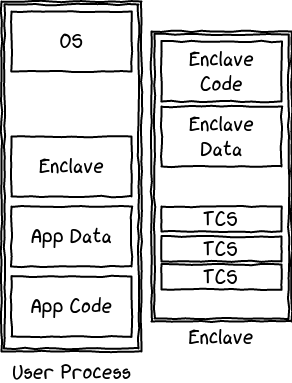 The enclave code and data are in plain-text before its initialization. While sections could technically be encrypted, the decryption key cannot be pre-installed (or it would not provide any additional security). Secrets have to come from the outside, might they be keys and sensitive data. The enclave must be able to prove to a third-party that it can be trusted (has not been tampered with) and is executing on a legitimate platform. remote attestation: an attestation process between an enclave and third-party not on the platform. A channel must have already been established between enclave A and enclave B. It is used by enclave A to retrieve the MRENCLAVE of B.
Enclave A calls EREPORT with the MRENCLAVE of B to generate a signed report for the latter. Enclave B calls EGETKEY to retrieve its Report Key and verify the MAC of the EREPORT structure. If valid, the enclave is the one expected and running on a legitimate platform. Remote attestation requires an architectural enclave called the Quoting Enclave (QE). This enclave verifies and transforms the REPORT (locally verifiable) into a QUOTE (remotely verifiable) by signing it with another special key, the Provisioning Key. The enclave generate a manifest including the challenge answer and an ephemeral public key that will be used later to secure the communications between the server and the enclave. It generates a hash of the manifest that it includes in the user data section of the EREPORT instruction. The instruction generates a REPORT for the Quoting Enclave that ties the manifest to the enclave. The enclave passes the REPORT to the application. The application transfers the REPORT to the Quoting Enclave for verification and signing. The QE retrieves its Report Key using the EGETKEY instruction and verifies the REPORT. It creates the QUOTE structure and signs it using its Provisioning Key before giving it back to the application. The application sends the QUOTE and associated manifest to the server for verification. The server uses the attestation service provided by Intel to validate the QUOTE signature. It then checks the manifest integrity using the hash from the QUOTE user data. Finally, it makes sure that the manifest contains the expected answer to the challenge. This blog-post gives an overview of the SGX internals. We've seen how memory is managed, how to load and call an enclave, and we detailed sealing, local and remote attestation. In the next blog-post, we will present the SGX externals (everything that is not embedded in the CPU). We will talk about the development process of an SGX enclave, the SDK and PSW (Architectural Enclaves).